January 17, 2018 January 17, 2018 Dan O. Staying away from any near-by pub this World Cup Fever. It was 1994 and a group of guys all gathered together, in their local pub, and were watching the World Cup. It was a peaceful and lovely time, that was all of a sudden turned into tragedy when they were all gunned-down by a bunch of a masked-men and it would come to be known as the “Loughinisland massacre”. It was a tragedy and the families wanted answers, but before they could ever get anything, the Irish peace process began and for some reason, the case went cold. The policy stopped getting back to the families, evidence dried-up, and basically, people stopped trying to find out what happened, except for the families that is. Nearly 20 years now, we’ve got the answers and well, they aren’t at all pretty. Pubs don’t usually get this wild, people. Alex Gibney already covered this subject in a rather short 30 for 30 documentary he did almost four years ago and I’ve got to give him the courage for going back to the story and figuring out just what the hell happened. Sure, a part of this documentary happening can be chalked-up to the “true-crime” fascination that is always prevalent in our society, but you’ve also got to chalk it up to Gibney himself for being an out-and-out investigative journalist that knows when he smells something fishy, to try and reel in whatever he can find. It’s a lot easier to say you’re going to do that, especially when you’re taking on the government, but Gibney doesn’t seem afraid and it’s why No Stone Unturned remains impressive and completes what it sets out to do: Give us answers. And it’s why No Stone Unturned, above all else, is an investigation into what happened, why, from whom, and how in the blue hell it’s continued to get covered-up all of these years later. Gibney steps over some toes and runs into some grey areas, legally speaking, and it’s astonishing to see him just constantly keep on pushing the investigation further and further into what seems like a never-ending abyss of lies, corruption, conspiracies, and dirt. It’s as if Gibney knew what he was getting himself into and is almost pleased that he’s able to ruffle a few feathers, but make no mistake, he never forgets who this movie is really for and that’s the family. After all, they’re the ones who have been waiting around, day-in and day-out, for nearly 20 years, for some sort of answer to their numerous questions and concerns. As the title of the movie says, Gibney seeks out to answer every question, give an answer, an explanation, and leave it up to those watching at home, how they feel. He knows this is a travesty and often times, that the answers are really hard to fathom, but he also knows that this kind of awful stuff can happen when you have dirty, relatively evil people at the top of the food-chain, who are just as corrupt as the criminals. And the web of lies that No Stone Unturned spins, what it deciphers from evidence, and how it all eventually comes together, despite the many different moving parts going at the same time, is truly compelling to watch. We know that by the end, we’re going to learn some new information, but what do we do with that? Do we try and take matters into our own hands and punish those responsible? Or, do we just sit around and move on with our lives, as if everything is still the same? Gibney has a lot of answers here, but that’s one he doesn’t and it’s why No Stone Unturned, as rough and as gripping as it can be, still feels emotionally stilted. Perhaps that was intended. So as to have us learn from the mistakes and problems of the past. 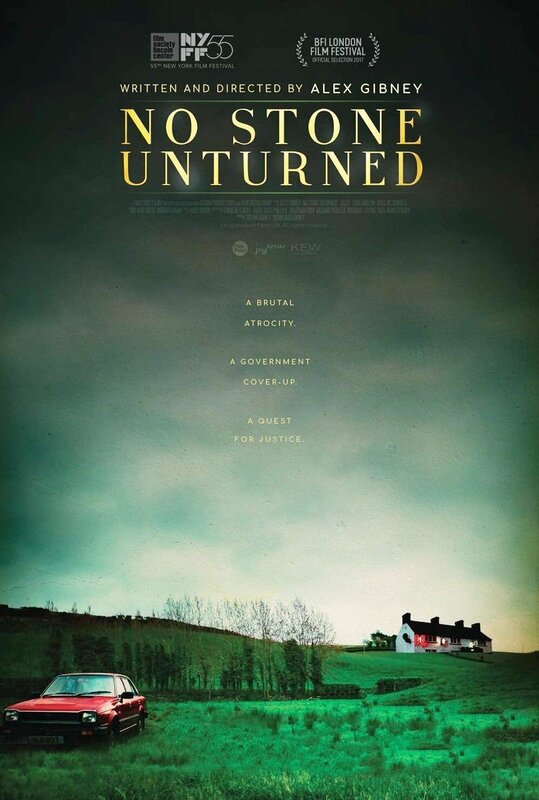 Consensus: As an investigation into corruption, murder, and injustices, No Stone Unturned finds Alex Gibney in total-form, getting down to the bottom of what happened and where to possibly go from here. Ah, lovely Ireland. Where’s the damn sun!? !